I did a trip with some friends where we flew into Cabo San Lucas at the tip of the Baja Peninsula. We spent two days of land-based diving at Cabo Pulmo, followed by a liveaboard trip to the Revillagigedo Islands. Cabo Pulmo is a pleasant little beach resort 60 miles north of Cabo San Lucas on the Sea of Cortez side of Baja. The area is a National Marine Park, so we saw lots of rays and fish schools as shown in the photos above. However, the water temp was in the low 70s and the visibility about 40 feet. I’m told the ideal time to visit here is around September, when both the water temp and the viz are much better. We then returned to Cabo and boarded the Ambar III with our genial hosts Mike McGettigan & Sherry Shaffer, and crewman extraordinaire Edgar Cesena. Our destination was the Revillagigedo (rev-ee-a-hee-hay-do) Islands, 24 hours by boat and about 220 miles south of Cabo in the Pacific. This is an archipelago consisting of four islands and we visited three of them. While Socorro is the most well known, we only spent a day there due to poor water visibility, with our remaining time split between the two islands pictured above—San Benedicto and Roca Partida. As is apparent in the photo above left, San Benedicto had a recent eruption. It was in 1993—a blink of the eye in geological time. Roca Partida (pictured above right with the Ambar III) is just a pinnacle out there in the middle of nowhere, and we were blessed with the relatively calm seas and good weather needed to visit and dive this site. 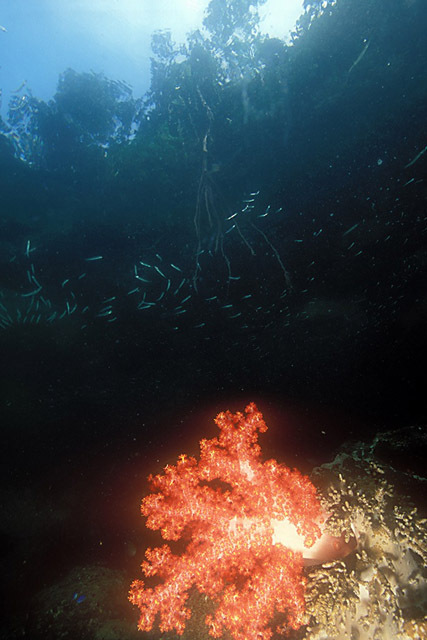 Pictured above is The Boiler, an underwater seamount at San Benedicto that is a well-known destination for experienced scuba divers. It is one of only a few places where giant Pacific manta rays (Manta birostris) gather on a regular basis. The Boiler attracts many kinds of fish, such as these blue jacks (Caranx melampygus) and bigeye trevally jacks (Caranx sexfasciatus), but mantas are the main attraction for divers. The typical reaction of any wild sea creature regardless of size is to flee when divers approach. When divers see a manta in most places, about the best one can hope for is curious but aloof behavior—the ray glides by at a safe distance, and any attempt by a diver to approach results in the manta’s hasty departure. The mantas at San Benedicto do the exact opposite—they actively seek out contact with divers! It is not uncommon to enter the water with no mantas present, only to have them appear suddenly out of the blue, as if drawn by the sound of our bubbles. While they could easily disappear with one flap of their 20-foot wingspans, they frequently stay with divers for hours, circling over and over. The Boiler is a “cleaning station” where mantas have been coming since long before the arrival of divers in order to be cleaned of parasites by orange clarion angelfish. One theory on why the mantas tolerate close diver encounters here is that the mantas may consider us nothing more than large cleaner fish. 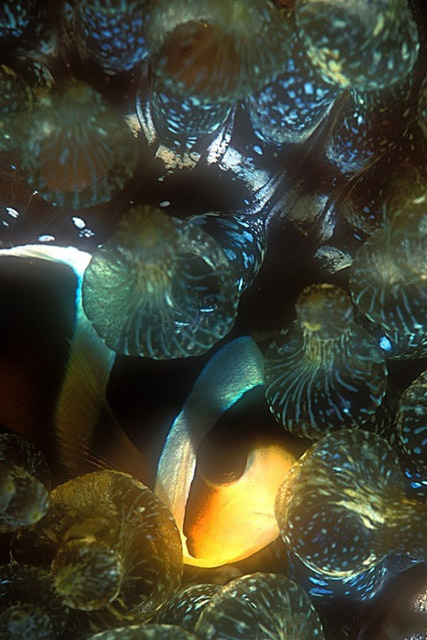 They particularly seem to enjoy the feel of bubbles from scuba divers on their skin. It’s fascinating to watch a manta come to a dead stop in the water to hover over a diver and have its belly tickled by exhaled air bubbles! Most of the mantas travel with one or two gray remoras (Remora remora), which attach themselves to their manta host via a suction disc on the remora’s head. 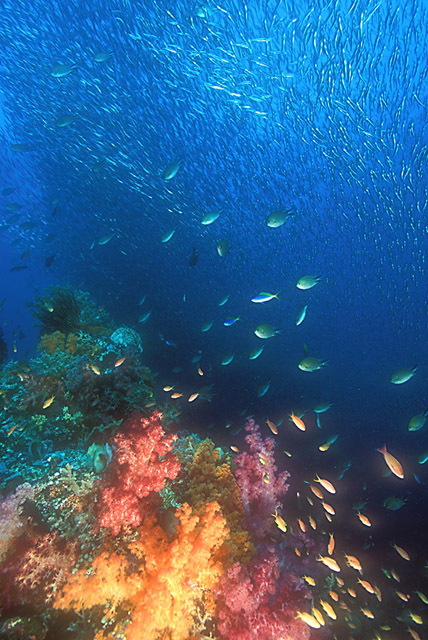 The remoras receive free transportation, while the manta may benefit from having these hitchhikers assist cleaner fish in keeping the ray’s skin clean of parasites. The photos above show my friend Skip Stubbs, who organized and led this trip. Skip and I were buddies on most of the dives. As Skip films world-class underwater videos, and I also concentrate on photography during dive trips, neither of us was much interested in modeling with the mantas for the other. I was on a dive trip to San Benedicto back in 1994, so fortunately I already had a number of “diver with manta” shots, such as the two above. On our trips between the islands we often saw brown boobies (Sula leucogaster—photo above left) and frigatebirds (Fregata magnificens—photo above right). The brown booby, while rarely seen from the mainland shore, is common off Baja in the Pacific, and frequently follows boats. For some reason the frigatebirds were attracted to the two antennas sticking up from the top of the Ambar III and took turns diving down to bite the tips. Not easy to do when the antennas are whipping back and forth on a moving boat in sea swells! What’s up with this behavior? Target practice? Some kind of game? Or something to do with the electromagnetic waves the antennas send and receive? The pinnacle called Roca Partida is mostly a sheer wall, but there are some small indentations. That’s Sherry Shaffer in the photo above left observing some resting whitetip reef sharks. I tried for a closer shot in the photo above right, but the current and swells made the approach difficult. I had better luck with resting whitetips on another trip with Skip back in 2003 to Cocos Island (off the coast of Costa Rica). There the water was calm enough at one site so that I could approach from below and “pop up” for a quick close-up shot before the startled sharks came shooting out of the cave. 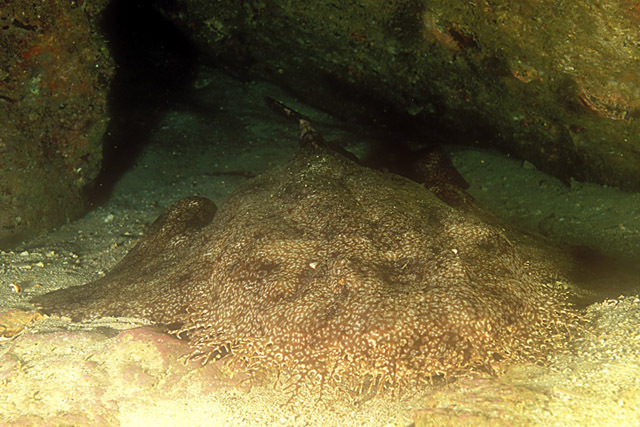 Roca Partida is famous for attracting pelagics not usually seen by divers on reefs. We had frequent encounters with schools of tuna & wahoo, but they hung out in the blue water, always staying just out of my range for a decent photo. My best photo opportunity at Roca occurred after I’d finished a dive. I’d deposited my tank in the inflatable and was just snorkeling around when I can upon this school of around 200 or more silky sharks (Carcharhinidae falciformis). They weren’t shy about my free diving down to them for a photo (quite the opposite!). However, I’d neglected to turn my strobes on, so in the above photos the sharks blend too much with the blue water background. Too bad, but still a memorable experience. Skip was still on Scuba and got some outstanding video footage of this school. While May is a tad late in the season for humpback whales to be out here, we saw (and heard them underwater) frequently. The “tail lob” shot (above left) was at Socorro Island. The calf shot (above right) occurred at Roca Partida, when all six of the guests on the boat snorkeled over to where a mom and baby were resting about 40 feet down. We observed for some time, taking care not to dive down and disturb them. Finally the calf surfaced for air, followed by the mom a bit further off, and then they performed a leisurely exit. As usual on liveaboard trips, we were treated to some beautiful sunsets, and as usual with my trip blog posts, this is where I’ll end this one. Many thanks to Mike, Sherry and Edgar, as well as to Skip for arranging the trip. The Ambar III is a terrific, comfortable boat which takes only a third of the divers I was with on the boat I booked for my previous trip out here in 1994. I hope to be back on the Ambar III for another Baja trip soon! I spent three days in February snorkeling with manatees at Crystal River, FL. The town is easy to reach—only about 1.5 hours by car north of the Tampa airport—the only annoyance being the five $1.00 tolls you have to pay EACH WAY on Highway 589. Even the Golden Gate Bridge District (hardly considered a paragon of financial astuteness, since they still lose money even with a $6.00 auto toll) figured out about 50 years ago they you can cut costs and traffic backups by doubling the toll and charging ONE WAY. Florida manatees (Trichechus manatus latirostrus) are a subspecies of the West Indian manatee. They are an endangered species, with a population estimated at about 3,300 animals in the state. While adult manatees average ten feet in length and about 1,200 pounds, their metabolism is very low, so they don’t generate a lot of body heat. In the colder winter months, they move from the Atlantic Ocean on the east coast or the Gulf of Mexico on the west coast into rivers and the natural springs that feed them, where the water temperature is a constant (and warmer) 72 degrees. More than 25 percent of the FL manatee population congregates in winter at the Crystal River National Wildlife Refuge. This is also one of the few areas where it’s legal to swim with them. The two photos above were taken on prior manatee trips—it’s been about a decade since my last visit. I’d hoped for similar sunny conditions on this trip, because the ambient light really contributes to an attractive photograph. No such luck, however—it was overcast all three days I was in the water with them. Thus I didn’t get anything this time that was as good as these two shots. Since there wasn’t sun, I tried for shots that included some of the animals’ reflections on the surface. In the lower-left shot above, you can see some of the “toenails” that manatees have on each flipper—they resemble what you see on the foot of an elephant, and that’s no coincidence. Manatees also have tough, grayish-brown wrinkled skin that’s similar to an elephant’s. Using genetics, scientists have determined that manatees are more closely related to elephants than any other living animal. It is believed manatees lived on land long ago and ate grass like elephants, eventually evolving to the aquatic life. They are the only marine mammals that are herbivores (vegetarians), often eating over 150 pounds of plants, grass and weeds each day. Seeing a cow and her calf together is always fun. “So homely it’s cute” is definitely a phrase that applies to young manatees! At birth, manatee calves weigh 60 to 70 pounds and are three to four feet long. Calves nurse for nearly a year and stay with their mother for up to two years, since reproduction is slow (one calf about every 3 years). Manatees at Crystal River are acclimated to people and very friendly. It can be a tad disconcerting to be taking a photo of one, while another swims up behind you and starts nibbling on your shoulder, but they are quite harmless. A manatee will swim up to you expectantly, and if you rub under the flipper it will often roll over to have its tummy scratched, as shown in the lower-right photo above. Just like your dog at home—but these guys can top 13 feet and 3,000 pounds! Snorkeling with manatees is a lot of fun and can be experienced by just about anyone. I was in a spring within King’s Bay called the Three Sisters, and there were people in the water who had never put on a mask & snorkel before! SCUBA diving is prohibited, since the air bubbles can disturb the manatees, and even free diving down using a snorkel is discouraged (although you are permitted to “sink” down—I was able to do this with just one four-pound weight while wearing a five mm wetsuit). Too bad about the lack of sun—guess I’ll just have to come back next winter! I spent a few days in early February checking out the northern elephant seals (Mirounga angustirostris) that migrate down to CA beaches each winter. They come from as far north as Alaska for the females to give birth and the males to fight for mating rights to produce next year’s generation. You can read many pertinent details about these animals and their remarkable comeback from near extinction if you scroll further down to the blog post I did after visiting this same area in early 2006. This is a popular elephant seal haul-out site—a beach just south of the Piedras Blancas lighthouse (a few miles north of the Hearst Castle). It’s also a popular spot for tourists, as a fenced-off boardwalk has been built here up on the bluff so the seals can be easily observed. The very helpful docents who belong to a group called Friends of the Elephant Seals told me that most of the serious fighting among the alpha males for choice beach space and harems takes place in December as they arrive. While disputes over mating rights continue until the seals depart around March, I only observed a few instances like those in the two photos above. With the lion’s share of the fighting in December and births peaking in January, most of the mating occurs in February. The peak of mating activity (fittingly enough) is mid-month–around Valentine’s Day. As I was photographing elephant seals from the observation boardwalk, I noticed a lot of these California ground squirrels (Spermophilus beecheyi) running around in the scrub brush on the bluff. They are very acclimated to people and didn’t mind posing. The above shot, with the out-of-focus ocean background, was my favorite of the trip. You just never know when a good photo opportunity will present itself…. While most of the fighting action was over by my visit, the weather was beautiful with sunsets to match. I didn’t notice the human standing on the cliff at the top right of the above photo until after I’d taken it. Dive in Canada during January? Well, maybe not as crazy an idea as you might think. Our destination was Hornby Island, which is about 80 miles NW of Vancouver—the “Miami Beach” of Canada. Or so it was described to me by my friend & photo pro Jon Cornforth, http://www.cornforthimages.com, who invited me to accompany him. Jon then got me a great deal re: some shares on a bridge in Brooklyn, but that’s another story. Seriously, Hornby has a great attraction this time of year—the Steller Sea Lions (Eumetopias jubatus) that migrate here each winter from as far north as the Bering Sea to feed on herring, which are gathering to spawn in early March. Stellers are listed as “Threatened” under the Endangered Species Act, and I had never photographed them. We stayed with our very genial hosts Rob & Amanda Zielinski of Hornby Island Diving, http://www.hornbyislanddiving.com. The lodge is two floors of modern, comfortable living space, with private bedrooms and shared large bathrooms on each floor. We had three delicious home-cooked hot meals each day, and there was even a sauna. The lodge can accommodate 16-24, and the usual clientele comes on weekends. We were a special “midweek” private charter that Jon arranged (diving Tuesday thru Thursday), and there were only four of us. Since we were all underwater photographers and thus space pigs by definition, we luxuriated in all the open areas we could clutter up! The Stellers hang out at a place called Norris Rocks. We got there in five-to-ten minutes from the dock (which was less than 100yds from the lodge) in a beamy, 32-foot aluminum dive boat with twin 225HP outboards. While the area can get some nasty winter storms, we had calm water and no rain or snow during our visit. However, we never saw the sun, just overcast skies or fog. This is normal, but too bad, because behind those sea lions and shoreline in the photo above are some really picturesque snow-clad mountains. Steller Sea Lions are lighter in color than the CA Sea Lions (Zalophus californianus) I’m used to, and much larger. A male Steller can grow to 10 feet and 2200lbs (a ton! ), while bull California will max out at 8 feet and 900lbs. The F 45 degree water temp (F 37 degree air) dictated diving in drysuits. Until I looked it up after the trip, I hadn’t realized it’s been over ten years since I’d used my drysuit—I’ve really wimped out on tank diving in my native northern California! Fortunately, I experienced no leaks or other problems. I need to wear 39lbs of lead with my drysuit (20 on the weightbelt, 8 each in two pockets on my buoyancy vest, and 1.5 on each ankle), which is 15lbs more than I wear diving with a thick wetsuit. But we never had to venture too far from where we entered the water—the Stellers were more than happy to find us. Sometimes we’d be buzzed by a single, curious individual. This was the more common greeting, however, especially when we’d first get in. You can see pro photographer Paul Souders (http://www.worldfoto.com) trying to take a picture in the photo above left, but about all you can make out of him in the shot above right is the yellow backup regulator. Oh, and they would BITE, trying to figure out what we were—fins, arms, hoods, hoses and strobe cords were all fair game. Not hard enough to do any damage, but a tad disconcerting when you’re trying to photograph them. Here are a few group shots I managed to get. We found that if you backed off a few feet after the first mob rush, they would pause briefly before resuming, which allowed us to get in a shot or two. These were all juveniles, but some were in the neighborhood of 600lbs. While we were immediately aware when one of the big bull males swam by because of their size, they didn’t deign to play. Good thing–a bite from something that weighs a ton would no doubt have been a more serious matter! The shot above didn’t work, because my strobes didn’t recycle to fire in time, making the photo too dark and also soft from the slow shutter speed. I included it because of the interesting behavior. That’s a bull CA Sea Lion playing (getting bit) by the juvenile Stellers. Male Californias migrate the “wrong way” up to southern BC in winter from CA & Mexico, also for the herring gathering. Usually I’m trying to get closer to my underwater photo subjects—not the case with the Stellers! This one was trying to eat my dome port, and even though I had a +4 closeup diopter on my 24mm lens, nothing is in focus. I did better with the “head shots” when they gave me a few inches of breathing room. They seemed to enjoy looking at themselves in the dome port, when they weren’t trying to bite it. We frequently noticed this “bubble blowing” from the Stellers, but it didn’t seem to denote the aggressive behavior I’ve experienced in the past with bull CA Sea Lions when I ventured too close into what they considered their territory. Well, maybe this one was a tad aggressive, but fortunately it was one of the cute smaller Stellers. I obviously had no time to “compose” this shot—it was a point-and-shoot photo opportunity, and one of my favorites from the trip. While there wasn’t much sunlight, we were fortunate to have calm water on each diving day, and being “mugged” by Steller Sea Lions has to have been one of the most interesting dive/photo encounters I’ve experienced. A great trip! I accompanied friends Skip Stubbs and Phil Colla to the Bosque del Apache National Wildlife Refuge for a few days starting in late November. Bosque del Apache means "woods of the Apache" and was named by the Spanish who observed Apaches routinely camped in the riverside forest there. Bosque is slightly more than an hour by car south of Albuquerque, along the Rio Grande Valley in Socorro County, NM. It is located on the northern edge of the Chihuahuan Desert, with an elevation that ranges from 4500 to over 6200 feet above sea level. Why would a photographer of "marine-related" subjects go to the desert? While over 300 species of birds and many other animals can be photographed there, I was concentrating on two species of large marine birds that migrate from the north to Bosque in the autumn and winter months–sandhill cranes (Grus canadensis) and snow geese (Chen caerulescens). A count taken the day before we arrived indicated about 5,000 sandhill cranes and almost 33,000 snow geese were there–as well as over 26,000 ducks. I'm not a "bird photographer" and lack the typical birder's lens–a 600mm f4, with a 1.4 or 2X teleconverter. At peak times (sunrise & sunset) there might be 40-50 photographers around, most with a camera setup like that or something similar. I was using a 300mm f2.8 and an 80-400mm zoom. So most of my shots were of the "scenic" variety, rather than tight shots of individual birds. Fortunately we had great weather (cold–one dawn was 26 degrees–but very clear) and loads of scenic photo opportunities, so I managed to contain my lens envy. Logistics were also easy. Bosque was only a few miles from our hotel in the town of Socorro, and each photo site had parking and adequate space for setting up tripods and cameras. Sandhill cranes can reach a height of four feet, with a wingspan approaching seven feet. My favorite shots were of cranes flying back for a landing in the ponds, with the golden light of sunset. With that sunset light in the background, stationary shots of the cranes were also worth taking. We'd get to Bosque before dawn for the sunrise, rest at mid-day, then go back in the afternoon for the sunset. When the sun was well up in the sky, there were opportunities for sandhill crane reflections and "takeoff" shots. Snow geese approaching as the light turns golden at sunset. Sunrise, at least for me, was not as productive as sunset–the birds had a tendency to fly away from, rather than towards us. Still, it was worth watching. A fun trip, and relatively easy to do compared to a lot of my other journeys! Back in August, I realized I hadn’t done a dive trip this year (snorkeled with sailfish & whale sharks in Mexico and took surface shots of humpbacks in Alaska, but only one tank dive all year). So I booked a week on the Kona Aggressor–a liveaboard dive boat which operates off the Kona Coast (west side of Hawaii–the Big Island). When I told this to one of my experienced diver friends, she asked one question: "Why?" It’s not an unreasonable question from divers who travel quite a bit, as fun as a week diving in Hawaii might sound. 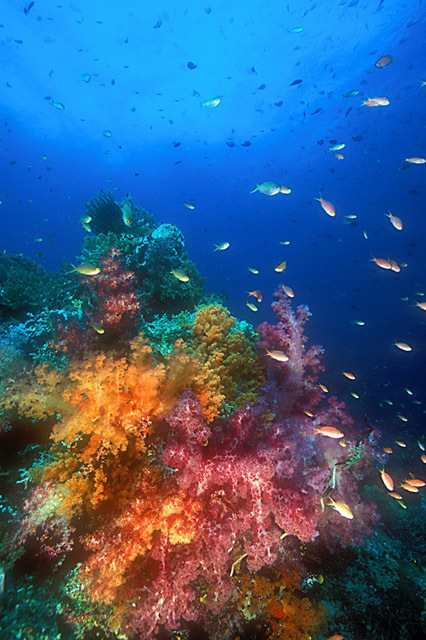 The reefs in Hawaii (above) are far less colorful then other locations further west. Fish, especially large schools, are not plentiful. I had two main reasons for deciding to go there. First, I hoped for more photo opportunities with green sea turtles (Chelonia mydas) at a site called Turtle Pinnacle, which is a cleaning station where the turtles allow the reef fish to remove algae and parasites from their shells. Unfortunately, the turtles didn’t show up at this site during our dive there–the two shots above were taken my on last visit to the Big Island in 2003. The second reason was that a trip to Kona from my home near San Francisco represents one plane flight each way for me. This might sound like a trivial reason, but on each of my last three trips by air (coming back from Mexico and both going and coming from Juneau) my first flight was delayed and I missed my connecting flights. We all know air travel is much more of a hassle now, and minimizing Things That Could Go Wrong was a factor in my decision. The photos above are of Holly Ong–my dive buddy for the week. Holly lives just south of San Francisco, and we are both members of the No. CA Underwater Photographic Society–but we didn’t know each other prior to meeting on this trip! We both have SCUBA certification cards so old (early 70’s) they don’t have individual numbers on them. She is one of those "been there, done that" divers, and an excellent buddy–always aware of where I was (versus my tendency to wander away with my face stuck in the viewfinder), and we have similar rates of air consumption. 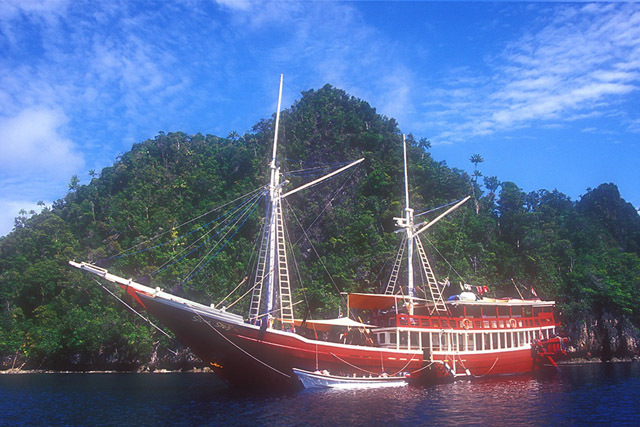 She is also very cheerful and upbeat–always an asset in the close confines of a liveaboard dive boat. The photos above are two of the tiny critters we saw. The shot on the left is a Black White Spotted Crab (Lissocarcinus orbicularis) which is about the size of a dime. 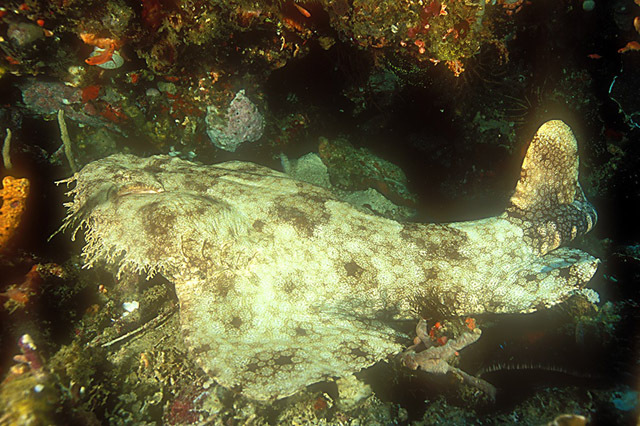 It lives on the Black Sea Cucumber (Holothuria atra) and does no harm to its host. The photo at right is of a Wire Coral Goby (Brianinops amplus) which is less than an inch in length. The goby tends to hide on whatever side of the wire coral you are not on, and with the coral itself moving back and forth, this is not an easy subject to photograph! Here are a few of the reef denizens we saw. The photo at top left is of a Whitemouth Moray Eel (Gymnothorax meleagris), which is one of the most common eel species (and there are many!) in Hawaii. Top right is a Guineafowl Puffer (Arothron meleagris) which occasionally hovers in place on the reef so you can grab a photo. Various members of the Scorpaenidae family can be hard to distinguish, but (I think) the photo at bottom left is of a Titan Scorpionfish (Scorpaenopsis diabolus), which is endemic to Hawaii. At bottom right is a Leaf Scorpionfish (Taenianotus tricanthus). They come in a variety of colors, are small and hard to find. I actually found this one myself–VERY unusual, as I’m one of the worst critter spotters. Most of the smaller subjects in my photos were pointed out to me by someone else. A dive photo trip to Hawaii wouldn’t be complete without frogfish (Antennariidae sp.) photos. These four photos are of two frogfish that were right next to each other. I think you can probably make out the frogfish in the two photos on the bottom above, but good luck with the two photos on the top if you don’t have experience seeing these guys! Well, here’s a hint–click on the photo at top left to enlarge, and find the mouth of the fish on the top right side of the photo. From about the middle of the mouth, proceed back to the left, about a third of the way and hopefully you can make out the eye. You can probably see the mouth of the fish in the photo top right (near bottom of the photo), but the angle makes finding an eye more work than its worth. The Kona night dives with manta rays (Manta sp.) were an unexpected highlight. The mantas feed on the plankton attracted by lights provided by divers and the nearby airport. 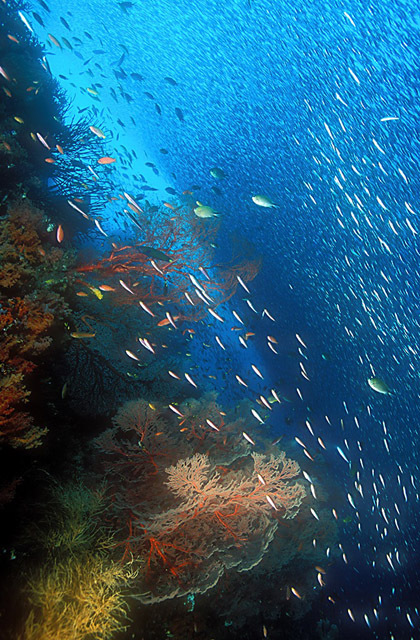 These dives are world-famous in the diving community and immensely popular. There were 10-12 boats and 40-50 divers present for each of the two night dives we did here. I’d declined doing them during my last trip, because I feared all the divers would be mucking up the visibility and getting between my camera and the mantas. The mantas, in feeding mode with their mouths open, come so CLOSE that it’s still possible to get good photos. 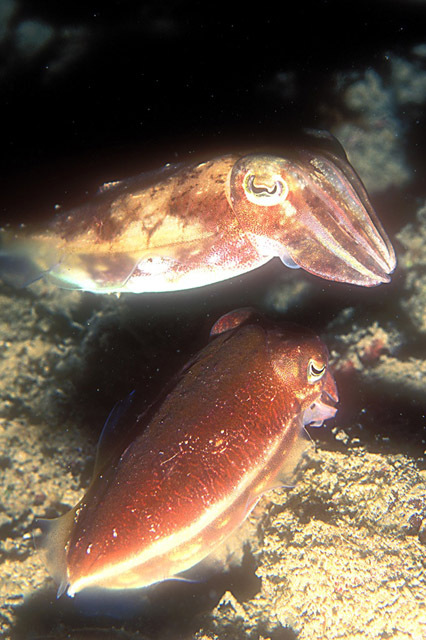 Another interesting aspect of this night dive was the appearance of these eight Oval Squid (Sepioteuthis lessoniana). Naturally this attracted a lot of attention, but I just waited until late in the dive when most of the other divers had gone back to their boats. I then tried for some shots with both the squid and a feeding manta, but I didn’t follow the "get close" part of the photo mantra ("get low, get close, shoot up") to get a good enough angle for a decent shot. Too bad–the photo opportunity was certainly there. Despite my apprehension about doing the manta night dive because of all the people, this shot above with the divers and manta turned out to be my favorite of the trip. You might notice none of the divers are wearing snorkels. We were prohibited from doing so, because the mantas swoop down so close a snorkel could scrape and harm them. So I learned my lesson, and pass it on to you–if you’re ever diving in Kona, DON’T neglect to do the manta night dive! and Stuart Westmorland (www.stuartwestmorland.com) on Jon’s boat, cruising the waters of Alaska’s inside passage. We flew up to Juneau on Friday evening, provisioned and gassed the boat Sat am, and motored 40-50 miles that afternoon. We photographed on Sunday, but late in the day Jon learned that while his wife and daughters were running errands, their house in Seattle had been severely damaged by fire! So we came back to Juneau on Monday and flew home Tuesday morning. We were there to photograph the humpback whales (Megaptera novaeangliae) that migrate up to the coast of southeast Alaska for summer feeding on krill and small schooling fish such as herring and mackerel. We spotted whales feeding near the small town of Tenakee Springs (above). This was the only town for many miles around, but the fish must have been there, because the whales stayed close to the town for a good portion of the day. Our primary goal was to get shots of the whales’ inventive technique known as “bubble net feeding.” This is a form of co-operative feeding behavior that is almost unique to this species (see my earlier post from a February 2008 trip on how sailfish do something similar). The humpbacks dive beneath a school of fish and encircle them in a “net” of bubbles that the fish won’t swim through. The whales then swim up through the bubble net, surfacing with their mouths open and their throats engorged with fish, which they swallow in one gulp. A recent article in BBC Wildlife Magazine described bubble netting as “…one of the most extraordinary displays in the natural world…” and having now witnessed it I would certainly not disagree with that assessment. The above shots of this behavior are from a fairly typical vantage point–since these are marine mammals in U.S. waters, you must keep a respectful distance and use a long lens (I had an 80-400mm zoom). These three shots were from a single encounter where the whales popped up suddenly, much closer to the boat. To say I was unprepared is an understatement. We usually tried to be on the bow when the whales surfaced. When this one happened, I was still inside the boat and had to just poke my camera through the portside window. Needless to say I was fortunate to get these shots, helped by a camera shutter speed of about 1/1000sec and image stabilization technology in the lens. Some other humpback shots. We didn’t have good light, but the Alaska background was nice. Since the Olympics had just started, I decided to add this shot from the "Synchronized Fin Wave & Bird Landing" event. The whales have their pectoral fins aligned pretty well, but those birds look like they need a bit more practice! Oh, and there are bears in Alaska! Because Jon’s boat is a compact 22 feet, we were able to motor up a stream and do some land-based shots of this young grizzly bear (Ursus arctos) trying to catch salmon beneath a waterfall. As I mentioned, we didn’t have much in the way of good light–those overcast skies in the photo above left were typical. As shown in the photo above right, we did get some shafts of sun for “golden light” during the long twilight (it didn’t get truly dark until around 10:00pm), but we weren’t able to get the uncooperative whales properly aligned with the setting sun. Hey, no complaints though! Considering the six days we’d planned to be out there photographing had been cut down to one, I was more than happy with the results! I went to Holbox Island (say "hole-bosh"–the "x" in Mayan is pronounced "sh") to snorkel with whale sharks. The sharks are there from mid-June to early September each year to feed in the plankton-rich waters. This was somewhat similar to my last trip in February in that it was land-based from an island, and I flew into Cancun (on Mexico’s Yucatan Peninsula) to get there. And while both trips included a ferry ride, this one was preceded by a two hour van ride to the town of Chiquila. So if you’re coming from the San Francisco area–it’s a long travel day (I overnighted in Cancun). tourist regardless of experience level can try it. at Ningaloo Reef in northwest Australia and near Thailand. The tour leader for our trip was Jacqueline Russell (http://www.WildOceanAdventures.com). She has done this trip many times, and capably handled the transport, lodging and snorkel operator details for our group of six guests. The Mawimbi Hotel where we stayed (outside area shown above) had nine rooms, all with AC. The staff took some effort to keep things clean, though it was hard since we guests were constantly tracking in sand from the beach. The boat we boarded each morning was anchored here, so you had a walk of only about 100 feet from the hotel–hard to get easier access than that, unless you’re on a liveaboard! Above are some shots of the whale sharks and snorkelers from the boat. The sharks were feeding about 35 miles offshore, which was an hour each way from Holbox. Only two guests were allowed in the water at a time (a good rule), along with a licensed guide. While there were many tourist boats out there, the whale shark population at this time of year is such that there was no problem finding a shark of your own to swim with. As you can see, we were blessed with flat, calm water. While I was told such ocean conditions are common for this time of year, please note that Hurricane Dolly blew through northeast Mexico and the Texas gulf coast about a week after I left–whale shark season here is also hurricane season. The problem with trying to get a "full body" shot of an animal this big is that you need better water visibility then we generally had. The viz was poor because of all the ‘lil critters in the water that the sharks were there to feed on. So poor viz kinda goes with the whale shark territory here. The shot on the left will give you some idea of how big these sharks can get (this one was estimated at about 38 feet), as you can make out our dive guide just above its head. 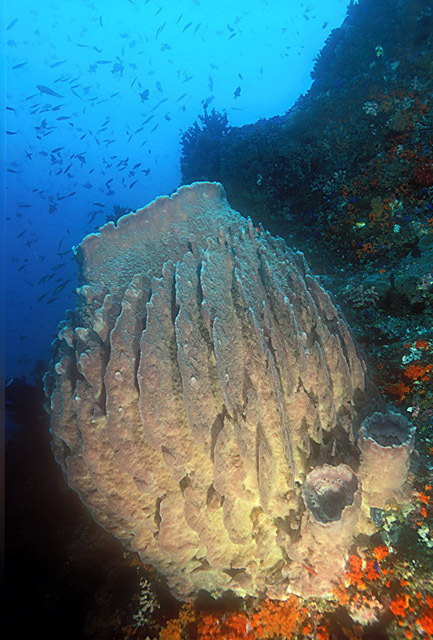 The shot on the right shows a snorkeler with a juvenile about 18 feet in length. I had better luck with my photos when I got in close. What some call the "first rule" of underwater photography applied here: "Eliminate the water between your camera lens and the subject." With my zoom lens set at its wide angle maximum of 17mm, I was VERY close in the first four photos above! At one point, I had just photographed a whale shark as it swam by, and as I turned around, this manta ray (about 15 feet across) also passed right next to me. We saw many of the filter-feeding mantas, as they were there for the same reason as the whale sharks. The beach in front of our hotel on the island’s north side faced into the gulf and gave us nice sunset photo opportunities as well. This was an enjoyable trip–close (compared to many of my destinations), and whale shark encounters are pretty much guaranteed! I was “land-based” for this trip–on Isla Las Mujeres–about a 15 minute ferry ride from Cancun, on Mexico’s Yucatan Peninsula. Every year around January-March sardines migrate north from off the coast of Brazil to feed on an upwelling of plankton about 40-50 miles from shore at the Isla Mujeres bank, and the sailfish arrive to feed on the sardines. The sailfish work cooperatively to “herd” the sardines–behavior only observed in billfish, dolphins and whales among all the marine animals in the world. The feeding sailfish were first filmed here only a couple of seasons ago for the Discovery Channel’s “Planet Earth” series, so for underwater photographers to get shots of it is still fairly unique. We left the dock every morning at dawn, and usually got back just before sunset. We’d pass this schooner every day going out and coming back–never saw anybody on it–looks like it’s waiting for the next “Pirates of the Caribbean” flick to be filmed. During my time there the sailfish action happened to be located about 50 miles north and 14 miles east of our boat dock–which meant we had a daily three-hour commute EACH WAY to get to it and back. These two photos were taken by the organizer of our trip, Amos Nachoum. That’s our “team” for the week on the left–don’t know why I look so grim–perhaps contemplating the bumpy three-hour ride back to the dock that day. 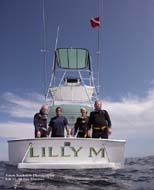 Our boat was the 30′ long and 12′ wide “Lilly M”–while the “commute” was long, this boat sure beat the rubber inflatables I’m usually on when trying to film big marine animals! The photo on the right (of me) shows how it worked–we’d locate a sardine baitball by watching for formations of frigate birds bunched closely over the water, and then roll in with cameras in hand, and snorkel to the baitball as fast as possible. We had SCUBA tanks on board, but didn’t use them because of the “need for speed.” Fortunately, everything usually happens pretty close to the surface. Sailfish have been clocked at 68mph–the fastest fish in the ocean–so the action was quick, brief (the small baitballs didn’t last too long), and hard to capture. These are the Brazilian sardines (Sardinella brasiliensis) that migrate more than halfway up the east coast of South America to feed in this relatively small area of the Caribbean Sea. If the sardines in that close-up shot on the left look nervous, they have reason to be! And here are the Atlantic sailfish (Istiophorus albicans) that are attracted by the sardines. It was hard to focus on individual sailfish, as they moved so quickly. They usually range from six to nine feet in length. That may sound like a large subject, but you had to be pretty close to get something that was more than a small part of the view shown by your wide-angle lens. The photos above show the sailfish “herding” the sardines to the surface and into baitballs to feed. We found the easiest thing to do was focus the camera on the baitball, then wait for the sailfish to come in. The “sail” is the dorsal fin and it often covers the entire length of the fish’s back. It’s folded down and to the side when the fish swims normally, but is raised when the fish is threatened or excited, to make it appear much larger than it actually is. Groups of sailfish raise their sails to help “herd” the fish schools into baitballs. The baitball moves quickly (so would you if you were a 10-inch fish chased by an 8-foot predator). The photo opportunities were usually when it either moved in your direction, or (infrequently) the baitball might hang out with or beneath us in an attempt to hide. We chartered the boat for seven days, and were able to get to the sailfish on five of them–pretty good, given that it was winter and how far we had to travel. On one of the other two days when the weather didn’t cooperate, we snorkeled with manta & mobula rays in the open water less than an hour from the dock. The rays were feeding on the plankton-rich water, so they stayed around, but that also meant the visibility was terrible–like trying to take photos while swimming in soup (which it actually was–to the rays!) In the above shot at left, the giant manta ray (Manta birostris) was doing an upside-down “barrel roll” while feeding. The shot looks “soft” not because of the focus, but due to the cloudy water. The water looks cleaner in the photo above right, only because I was about two feet from the ray. You can just make out a snorkeler with his camera, above and behind the ray–gives you an idea of the relative size of the manta (they grow to in excess of 20 feet), and also how quickly the visibility decreased if you weren’t VERY close. While the mantas were solitary feeders, the mobula rays (Mobula sp.) liked to hang out together. 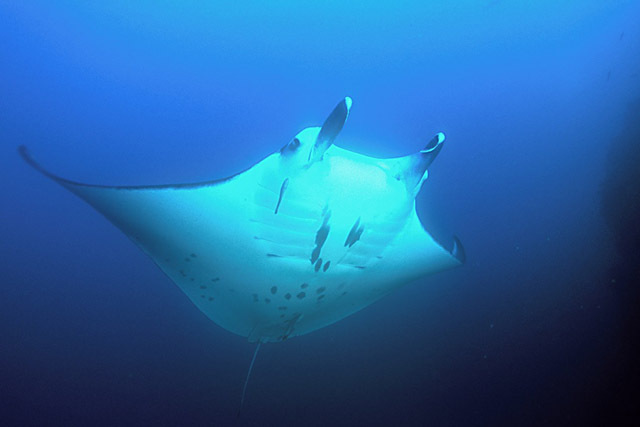 Often mistaken for mantas, mobulas are much smaller, rarely over ten feet. On the other day that we were weather-challenged, we put on SCUBA tanks for the only time that week and did a reef dive. I hadn’t heard much about the reef diving around Isla Mujeres, and now perhaps I know why. I was first in the water, and surfaced five minutes later, convinced I’d missed the reef. 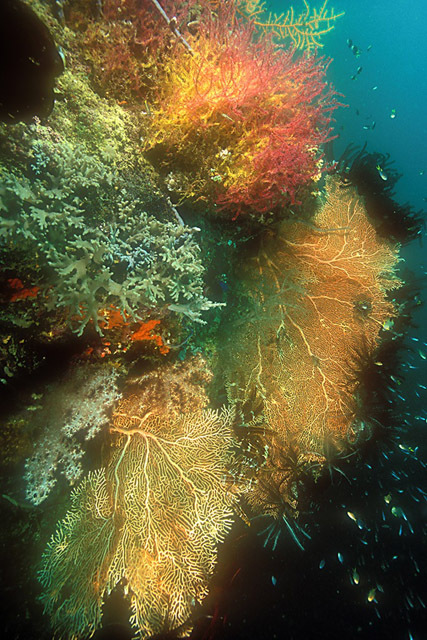 No–I was on the “reef”–it just didn’t look like what I think of as a reef. Once in a while we’d see an aggregation of fish or a solitary sea fan as above, but not often. Trip Leader Amos Nachoum obligingly modeled for me at one of the few spots of color we encountered on this dive. As usual, I’ll end with a sunset. I knew this trip was a “roll of the dice” because so many things have to go the right way to get the photo–calm seas, sun for ambient lighting and fast shutter speeds, water visibility, subjects present, close and cooperative (or at least preoccupied enough to ignore you), and so on. It was definitely not one of those “Go down the anchor line to the barrel sponge and the frogfish will be just on the left” kinds of trips–so I was happy to get some sailfish images. I did a three-week dive trip to Indonesia in Sept-October, which was very capably arranged by my friend Drew Wong. For those of you who are geographically challenged like me, Indonesia is a republic in Southeast Asia consisting of more than 17,000 islands spread over 3,000 miles. It is the world’s fourth most populous country, with over 234 million people. The trip required five plane flights each way. I went from San Francisco to Hong Kong, then Singapore, then Bali. After an overnight, we took domestic flights to Ujung Padang, then Ambon. Repeat same on the way back, except our flights started out of Sorong, where we ended up after +1,000 nautical miles (most travel was at night). We dove in the Banda/Seram Sea and the itinerary included Raja Ampat (”four kings”), which is an archipelago of 1,500 islands and cays located off the northwest tip of West Papua (known as Irian Jaya until recently). 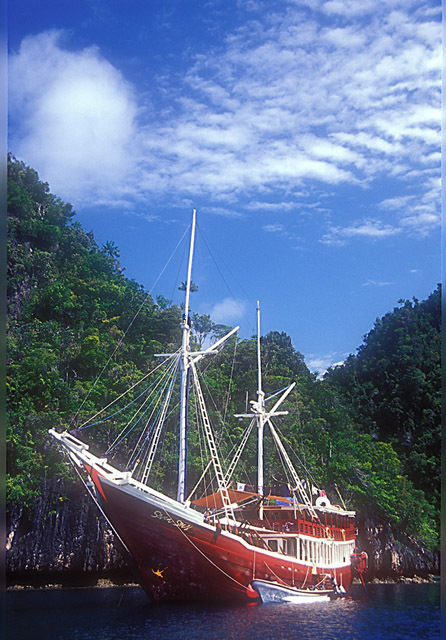 Our liveaboard dive boat was the Seven Seas, an upscale schooner which just started up in 2006. A roomy boat with a length of 100′ and a 25′ beam, this is a classy operation–for example, we were served four meals daily (we got second breakfast, just like hobbits). Freshly dried towels after every dive, waited on hand & foot by a crew of 14, etc., etc. 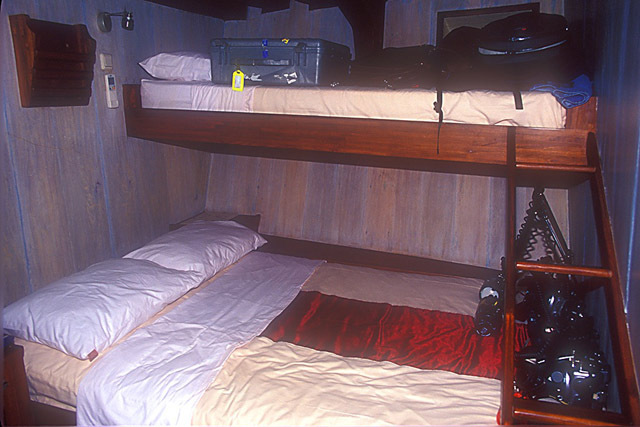 Of course, it didn’t hurt that while the boat can hold up to 18 guests, we were 11, and I had my own room with double/twin beds for the 16 nights I was on board. Each room has it’s own bath, and individual AC which actually worked when you adjusted it. There was also plenty of space on board to work on cameras–mine are in the photo above because I didn’t get around to taking the shot until the end of the trip, and I’d brought my rigs to the room to break them down for repacking. the background that the visibility was often–challenging. Guest Robert Delfs, an ex-pat who lives in Bali and has been on numerous Seven Seas trips, said this was the worst viz he’d seen. These were the times to practice your close-focus when shooting with a wide-angle lens. 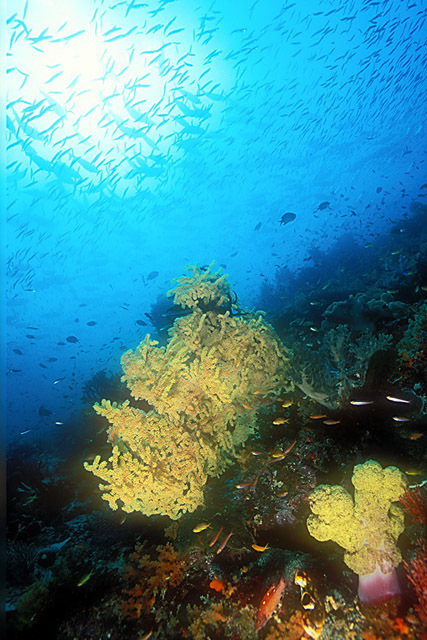 On the other hand, we also experienced dives with all the blue-water backgrounds a photographer could want…. Indonesia is a “macro paradise,” but I made a conscious effort to mostly shoot wide angle, even to the point of leaving my 105mm & 200mm “mas macho” macro lenses at home (on purpose, as opposed to my usual method of forgetting things). Why? I could say it’s because I shot a lot of macro on two prior trips here (one to this general area in 2002, and another to the Komodo area further west in 2001), but you can always find new macro subjects to shoot, so that’s not it. I’d say the real reason is that I’m kinda “tired of macro.” That said, I did bring the 60mm, which is flexible for slightly wider macro subjects such as the two cuttlefish above, and when combined with the pricy ($500) Macro Mate adapter (can be slipped on and off depending on the subject) you get up to twice life-size (2:1) reproduction. 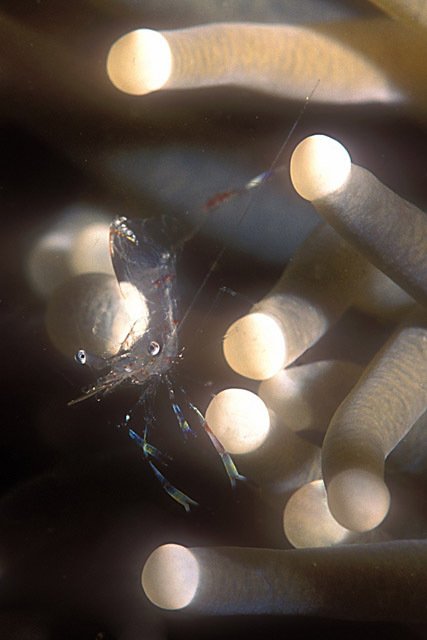 I used that combo for the above anemonefish, shrimp and blenny shots–none of these are rare subjects, but I was attracted by the area around each. 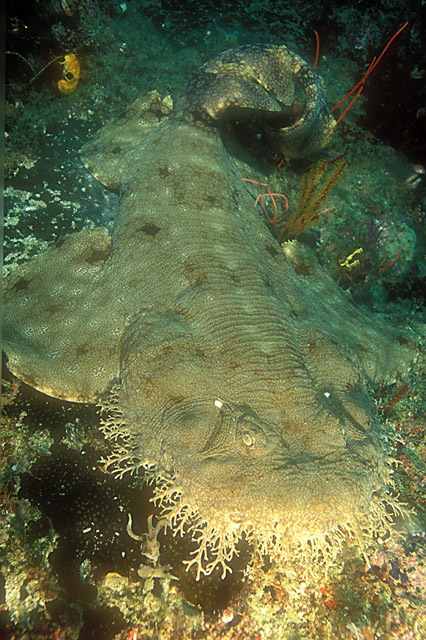 Tasseled wobbegong sharks (Eucrossorhinus dasypogon) can be hard to spot, but three were pointed out to me on dives at different locations during this trip. Fellow guest Craig Ruaux showed me the first (top, left) which was in a cave, and Divemaster Tommie pointed out one (top, right) that was under a ledge. Thanks, guys! The shots at lower left and right above are of the third shark, which guest Celine Vignolles found. This shark was large (6-7 feet), but had its tail curled up so that you could get the whole animal in a shot while still being close. Best of all, it was lying on TOP of a ledge (albeit at a depth of 90′), without the roof of a cave or coal head over you to hinder camera placement. Merci beaucoup, Celine! 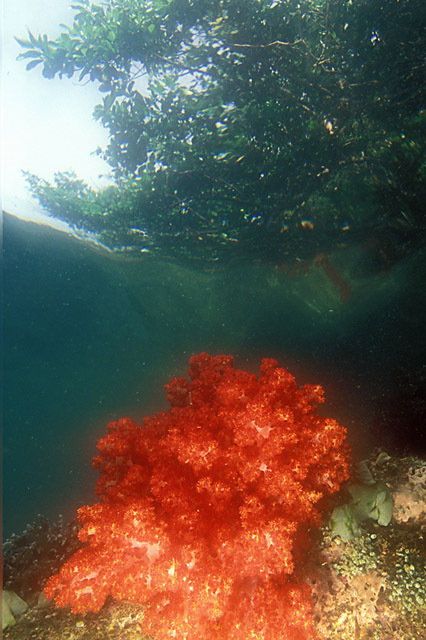 One shallow area off an island in the Triton Bay region didn’t have good water visibility generally, but there was some soft coral growth near the surface, so I tried "reef meets rainforest" shots. Here are a couple of photos guest Robert Delfs took of me during the incredible dives off Misool–I’m in the middle of that humongous swirl of fish in the shot above left. As if the fish schools weren’t enough at this place, I saw mobula rays circling up in the water column, then this manta ray swam out of the blue and up & over me. This shot was taken on our last dive–at a spot called Melissa’s Garden, near Cape Kri. 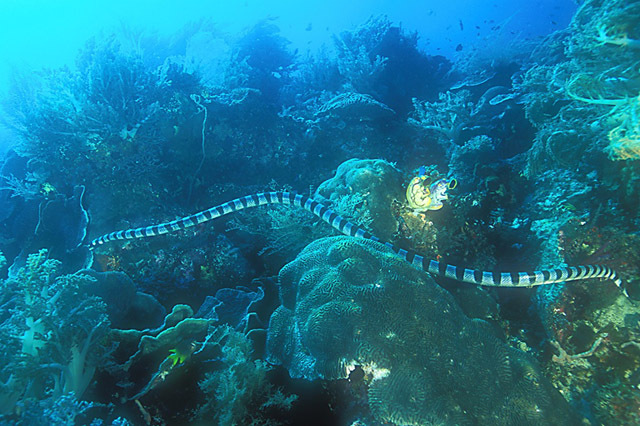 Not a good photo (the sea krait was foraging up current, and we were being pushed swiftly the other way), but notable for its size–as you divers can tell from the reef surrounding it, this was about an eight-footer! That’s it for this trip, folks! I went back for my "Fourth Annual" with Jim Abernethy’s Scuba Adventures in May, again looking for shark photo opportunities (scroll down on this blog to see the reports on the Third and Second Annual Shark Fest trips). Why did I do it again? For one thing, I can’t think of another operator who has consistently exceeded my expectations every time I’ve been out with him–and yes, Jimmy and his crew did it AGAIN this year! (561-842-6356; www.scuba-adventures.com) Second, this was a "different" trip. Rather than going on an overnight run out of West Palm to the waters off Grand Bahama Island for the shark "usual suspects" (though we did go for those on the way back as well), on this trip we traveled for two days and about 300 miles to far southeast Bahamas, in an area known as the Tongue of the Ocean. We were looking for a specific species of shark that I’d never even seen, much less photographed, in my 35 years of diving–the Oceanic Whitetip (Carcharhinus longimanus). The Oceanic Whitetip is stocky and bulky, but can grow to 13ft in length, and will be confused in name only with the small, harmless and (in some spots) common-as-flies White-tipped Reef Shark (Triaenodon obesus). The Oceanic Whitetip is easily identified with its large, paddle-like pectoral fins, which are significantly larger than most other shark species and conspicuously rounded. There are at least a couple of reasons why I’d never seen one: (1) they are a "pelagic" shark, which means they prefer off-shore, deep-ocean areas–not likely to be spotted on the shallow reefs we divers frequent; and (2) there are a lot less of them to see–those large fins are highly valued as the chief ingredient of shark-fin soup–and studies have shown this shark’s population declining anywhere from 70 to +90 percent, depending on the area, due to longline fishing. Since it was a two-day trip to get where we were going, Jimmy stopped on the way at the site of the Theo, a wreck lying on its port side at a depth of 90-110 feet. Not many schools of fish on this “artificial reef” as yet, but an interesting dive. So this is how it worked. Since these are pelagic sharks, the crew would put out a float in the “blue water” with these sealed milk crates attached and filled with bait. We had success from the very first day of our arrival, and for each of the five days we spent in this area, both the weather and the number of shark photo opportunities seemed to improve. Divers and bait crates would essentially drift with the current, the sharks coming and going. It was a tad unnerving when you had to keep your eye on multiple sharks, and no reef to hide in. There was also a slight problem at times when it was windy, as the float would be pushed faster than the current, and we’d spend most of the dive kicking to keep up, pausing for the occasional photo. If it got too windy, Jimmy would just attach a line from the float to the boat to slow things down–and oceanics are NOT a shark that’s intimidated by the presence of the boat–or much of anything else. Sorry if the above represents too many shots of the same subject, but oceanics WERE the purpose of this trip, and we did five days of photos with not much else to shoot out there in the blue water. After not having seen one before this trip, I now have a lifetime supply. We felt the trip had been a success after the first day we got there–and then weather, viz, number of sharks, etc. just kept getting better. See how my expectations got exceeded by Jimmy’s operation yet again?? Another aspect worth noting is how cooperative a photo subject the oceanic whitetip is. One source mentions this shark “….makes up for its comparatively leisurely swimming style with an aggressive attitude.” So the shark approaches slowly, allowing you ample time to frame the subject–and then you just watch it come closer and closer in your viewfinder before clicking the shutter. I set a personal trip record for the number of times the dome port on my camera housing was bumped by one of these sharks, but I’d characterize the behavior more as bold/curious than “aggressive.” They were just checking us divers out as a potential meal–nothing personal. Once they determined we were not the source of the fish scent, they would move on–but would come back CLOSE, again and again, just to make sure. Not every diver’s idea of a good time, but a shark photographer’s dream! No less an authority than the late Jacques Cousteau described the oceanic whitetip as “…the most dangerous of all sharks.” Indeed, this shark is considered responsible for more fatal attacks on humans than all other shark species combined. This statement needs a Barry Bonds Home Run Record-sized asterisk, however. Because this is an open ocean shark, these fatalities are usually a result of predation on injured, bleeding people from shipwrecks or downed aircraft. For example, oceanics are deemed responsible for many of the 60-80 sailor shark deaths after the sinking of the USS Indianapolis in 1945 (remember that description by the Robt. Shaw character in the movie Jaws?) Such incidents are not included in common shark-attack indices, and of course the near-shore unprovoked attacks by great whites, tigers and bull sharks receive much notoriety. Since we were not “perceived as prey,” we didn’t really feel threatened, although we kept a watchful eye on every shark approach, and it probably wouldn’t have been a good idea to go in the water if you’d cut yourself shaving that morning. :>) ..
Oceanic whitetips usually roam in isolation from their own species, but have been observed with pilot fish, dolphin fish, remoras and even pilot whales. We saw several sharks accompanied by small schools of pilot fish (Naucrates ductor) and others with rainbow runners (Elagatis bipinnulata)–another open water fish (jack family) rarely seen over reefs. We named this juvenile oceanic “Peanut.” The perspective is distorted a bit in the above photo with the diver in the background–she’s a lot smaller than she looks. The pups are born at a length of 26 to 30 inches, and she was about 3 & 1/2 feet long, so this was a young shark! Watching her navigating with those outsized pectoral fins she had yet to grow into was like watching a puppy golden retriever learning to run without tripping over its own big paws. Once we had our fill of Oceanic whitetips, we visited some other sites. These shots are from Allen’s Cay in the northern Exuma chain. It’s a popular anchorage, less than a day’s sail south of Nassau, and the scenes are more typical of what most people expect to see on a Bahamas vacation! The Allen’s Cay Rock Iguana (Cyclura cychlura inornata) feeds on fruits, leaves and flowers of the plants on this tiny island. We did a dive on a blue hole near Nassau, but the viz in the hole was terrible, so we mostly poked along the rim, doing reef shots in about 30 feet of water. And then there was (of course!) a stop on the way back at Tiger Beach, the main location for my prior Bahamas Shark Fest blogs. You know things are normal when you see the lemon sharks (Negaprion brevirostris) circling on the surface after the crew hangs bait crates off the boat’s stern. We also “wrangle” the sharks in with bait attached to fishing lines–if you click on the above shot on the right to enlarge it, you may see the bait fish in the lemon shark’s mouth. Laugh if you will (and I’m sure you will), but all guests and crew worked to hook these small fish. They played an important role in bringing in the sharks, as noted in the paragraph and two photos just above this portrait of the proud fisherman and his catch (thanks to Jim Abernethy for the shot). Underwater shots of lemon sharks. And what would Tiger Beach be without tiger sharks (Galeocerdo cuvier)? One of the highlights of our trip was the return of Emma (first three photos above), the star of my very first blog posts from our “Second Annual” trip here. Emma was docile as ever, coming close but not exhibiting any threatening behavior. The only difference is that she’s even bigger (about 14 feet now) and really HUGE around (maybe pregnant?) The photo on the lower right is of another tiger on the scene–not as big as Emma, but not at all shy about coming close, either. We then spent some time at a place Jimmy calls Carcharhinus Cut. Similar to the site we dove last year called the Mother Lode, it’s an opportunity to photograph Caribbean Reef Sharks (Carcharhinus perezi) with the colorful reef. The photo on the right, above served as a kind of reminder to me–should we divers be emulating the behavior of those fish hiding in the reef? :>)..
As usual, we also had fabulous Bahamas sunsets to photograph–a good point at which to end this blog post. The group shot photo above is courtesy of Jim Abernathy. I now have photos of all the “Big Five” shark species–great white, tiger, oceanic whitetip, bull and great hammerhead (www.seaimages.org), click on “Photo Examples” than click on “Sharks” for more)–and all except the great white shots were taken on Jim Abernethy trips. Many thanks to Jimmy and crew members Wade, Don, John and Ed for another fantastic trip! I’ll be back next year! Hi folks! I went back to the Bahamas last month to take shark images for the third time in three years with the same dive operator, and while all these trips have been very good (hence my repeat visits), this one was the best trip yet! The weather was great (the best they had experienced up to that point in ‘06), the “usual suspects” showed up (lemon, cribbean reef, bull and tiger sharks), the visibility underwater was excellent, and we also had photo opportunities with several other subjects, including dolphins. This is Jim Abernethy, the guy who makes it all happen. Jim is the owner of Jim Abernethy’s SCUBA Adventures Inc., and it’s truly one of the very best operations I’ve encountered for delivering GREAT photo opportunities. I do not praise dive operators lightly (some of you are probably rolling your eyes as you read this, knowing what a vast understatement it is), but anyone who is interested in shark photography should give Jim and his excellent staff a try. You can find out more by going to http://www.scuba-adventures.com , sending an e-mail to info@scuba-adventures.com or calling 561-842-6356. I can offer no greater endorsement than to say I’ve already signed up for my “4th Annual” in 2007. Jim Abernethy likes to get “up close & personal” with his photo subjects. That’s Jim in #2 above using this photo technique on a loggerhead turtle (Caretta caretta). You can see from Jim’s photo #3 on the right above that he gets some really dramatic, world-class images this way (I’m malingering in the background), but he’s too busy with his dive operation to really market them very much. Oh, and his “up close…” photo style DOES have an occasional disadvantage, such as when he uses it on tiger sharks…..
Yup, that’s Jim’s housed camera in the mouth of a tiger shark they named Notcho. I’m grateful to Paul Krupela (pkrupela@earthlink.net; 949-492-1136) who took photo #4 above on a trip prior to ours and allowed me to use it in this blog post. Jim was able to retrieve his camera rig and actually has an image taken by Notcho when it bit down on his camera housing’s shutter release, but I didn’t include it here because–frankly–it’s not very good. It’s a vertical shot of sand & water, but there’s no central subject, the line dividing the sand & water is not straight, and….oh, I could go on, but since Notcho is a novice photographer, it’s probably not fair to offer too much criticism at this point….. 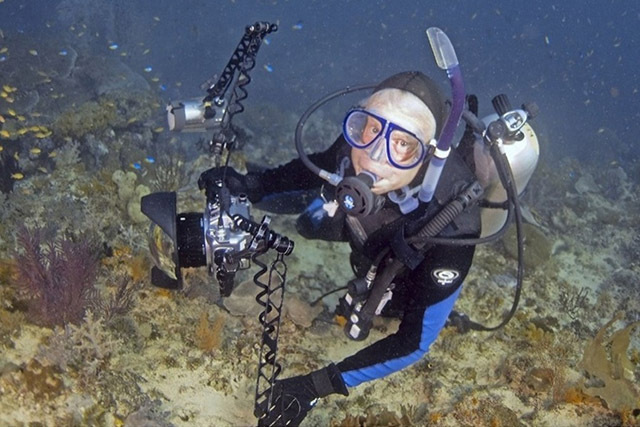 Photos #’s 5 and 6 are a couple of other images Jim Abernethy took of me with a tiger shark. Some of you might recall the close encounters I had on the "2nd Annual" last year with a tiger shark they call Emma, who seemed to be attracted to my yellow snorkel (scroll down to the first two posts at the start of this blog for more on that). I wisely divested myself of that snorkel after a couple of days with sharks on this year’s trip, until close to the end when I needed it for snorkeling with the dolphins. Photo #7 shows a “day at the office” for the location called Tiger Beach. You can see a half dozen or so 8-9 foot lemon sharks in the foreground and on the left, a tiger shark just to the right of the crewperson holding the bait basket, and there are two more tigers in the background on the right, though they may be hard to see in this blog image. The point is–this is a REALLY hot spot for shark photography! Three changes I noticed about this location from my prior visits are: (1) the visibility was MUCH improved–we had about 10 feet of viz two years ago; (2) the sharks seemed to come around much sooner and in greater numbers (and yes, we consider this a good thing…..); and (3) Jim has found some spots here that are not just sand bottom–there are also small gorgonians, corals and so forth, which improve the photo opportunities. These are lemon sharks (Negaprion brevirostris) at Tiger Beach. Note how the growth on the bottom keeps the sharks elevated off the sand, allowing underwater photographers to follow the Golden Rule for positioning of the camera lens vs. the subject: “get LOW, get CLOSE, shoot UP!” Lemons have scary-looking teeth, and my fish ID book says they are “considered dangerous” and “can be aggressive” but we tended not to worry much about them, due to the number of tiger sharks that were there at the same time. You know, like when Butch told Sundance not to worry about drowning because the fall was probably going to kill him….. I noticed the above behavior in #12 on the part of lemon sharks about 4-5 times during this trip. The shark would move away from the main group (which generally would stay close to the bait baskets), settle down in the sand and open its mouth, allowing the sharksuckers (Echeneis naucrates–Remora family) which are usually attached to the shark to swim into its mouth and clean it. The shark becomes its own “cleaning station!” I only got one “grab shot” of this behavior, but you can make out one of the smaller sharksuckers exiting the mouth of the host shark. These are Caribbean reef sharks, at a place Jim calls the Mother Lode. Jim provided invaluable help in positioning me to get the shots of these sharks with the eel in #13 and the sponge in #14. These are also Caribbean reef sharks, but at a different location we visited–Walker’s Key. As you can see, the water was green and the viz therefore limited. I included these images because in #16 the shark looks like it has either recently eaten very well or is very pregnant, and #17 shows the shark acting in a way that usually means you should exercise some caution–the pectoral fins are down, which we call “hunched for lunch” behavior. We did some dives with bull sharks (Carcharhinus leucas), but like last year, they tended to be cautious and keep their distance, which made for limited photo opportunities. We had some excellent tiger shark (Galeocerdo cuvier) encounters at Tiger Beach–I spotted five tigers at one time, and that means there were more, since you never see them all at once. Jim & the crew kept cautioning us to stay near the stern of the boat on the bottom (only about 15 feet deep) and face outward, keeping the sharks in front of us and in sight. This proved nearly impossible, however, as the boat was often swinging in a long arc, and there were just too many sharks to always be aware of what might be coming up behind you. This had not been a problem on my prior trips because we had never encountered this many tiger sharks at one time. That’s Jim in #21 above (probably trying to tell me I’m not where I’m supposed to be). This was a literal “got your back” situation, and we eventually became pretty good at signaling fellow divers when a tiger was approaching from behind. I used to have fun playing “peek-a-boo” with my daughters–I of course would get bored before they would. We haven’t played it recently though, since one is now 27 and the other turns 23 this month…… Anyway, playing this with a tiger shark was maybe not quite as much fun–but it definitely kept me from getting bored! A couple more shots I took of that loggerhead turtle Jim found. In addition to the sharks, large groupers were attracted to the bait baskets placed on the reef at the Mother Lode dive site. I THINK #’s 27 & 28 show a yellowmouth grouper (Mycteroperca interstitialis), #29 is a black grouper (Mycteroperca bonaci), and #30 is a nassau grouper (Epinephelus striatus). We dove a site called the Sugar Wreck, which had many nice schools of colorful fish swimming over the remains of this boat. These are french grunts (Haemulon flavolineatum). We spent our morning on the last day of the trip snorkeling with Atlantic spotted dolphins (Stenella frontalis). My prior trips were both in February, which is not the right time of year to look for dolphins in the Bahamas. The month of May not only offers the probability of better weather (after winter, before hurricane season), but the opportunity to have encounters with these loveable marine mammals as well. At left is a shot of several members of our group taken by Jim Abernethy. We saw many nice sunsets such as #42 above. The swim step at the stern of the boat was a bit hectic during sunsets like this, as several folks who were more adventurous than I attempted to get this shot with a tiger shark biting the bait line in the foreground. Oh well, that’s something to “shoot” for on my “4th Annual” in ‘07……..
That’s it folks! 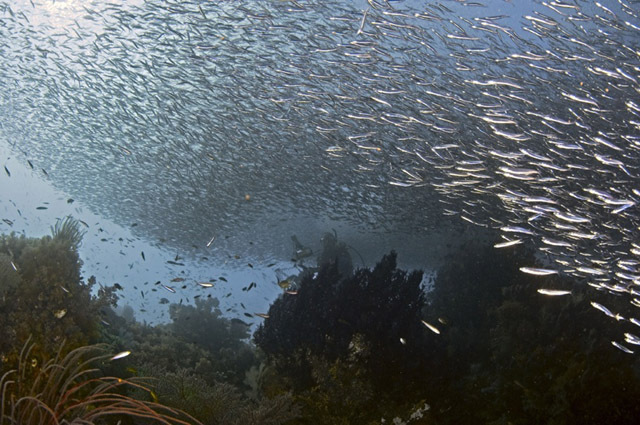 My next trip (June 19-July 10) is to try and shoot the sardine run on the east coast of South Africa. This one is a real roll of the photographic dice, but if I get something you’ll see it on my next blog! Hi folks! In January and February I took a couple of three-day trips with friends Skip Stubbs and Phil Colla to Piedras Blancas, CA to visit a rookery of northern elephant seals (Mirounga angustirostris) and observe the annual birthing/breeding season. Piedras Blancas is located about eight miles north of San Simeon, and about five miles north of Hearst Castle. This was our destination–the beaches just south of the Piedras Blancas Lighthouse. The elephant seals start showing up here in November, and the height of the birthing/fighting/breeding season is in February. Except for short periods during April-August when the females, juveniles, subadult and adult males return at different times to molt, elephant seals spend the rest of their lives in the ocean, ranging as far north as the south coast of Alaska and the Aleutian Islands. 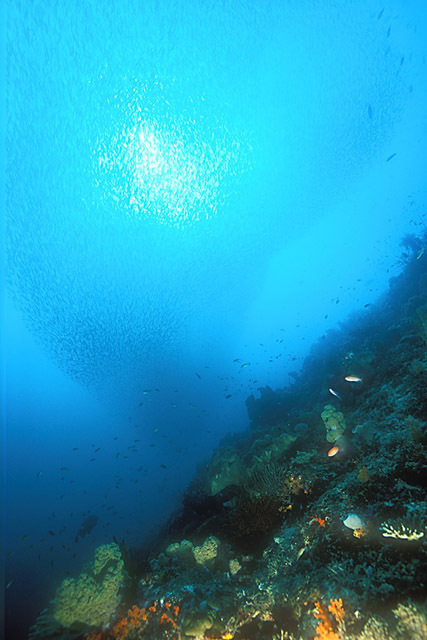 The can dive to a depth of one mile (a distance only exceeded among air-breathers by sperm whales) in search of squid and other deep water prey. Given all the bad news we’re constantly hearing about the environment and the negative impact on our wildlife, elephant seals are a remarkable exception. These animals were slaughtered in the 1800’s for the oil from their blubber. By 1892, only 50-100 individuals were left. In the 1920’s they were protected by Mexico and the U.S. Today, the population has rebounded to approximately 160,000, about 14,000 of which populate almost four miles of the coast at Piedras Blancas. A parking lot and large boardwalk has been built in one section which offers close viewing (although a long zoom lens is recommended). Births of the black pups start in mid-December, and peak around mid-February. The mother will vocalize, bonding her voice and scent with that of her pup, so they can find each other if separated as the population grows on the beach. The mothers nurse their pups on fat-rich milk for 28 days. During that time the pup, which weighs about 60lbs at birth, will quadruple its weight. The black coat fades to brown as the pup matures, at which point the pup is called a weaner. The weaner will remain at the rookery for about two months after the mother stops nursing, living off its fat reserves as it learns to swim and forage. A flock of gulls hovering over the seal colony usually means a birth has occurred, as the birds clean up the afterbirth. Hard to believe those cute little pups can mature into males that reach 16 feet in length and can weigh 5,000lbs! The females are considerably smaller, but still can reach up to ten feet in length and weigh one ton. Adult males are awesome behemoths, with the long noses that give elephant seals their name. One of the small coves at Piedras Blancas has a “bachelor’s beach” where younger males congregate. Since there are no females, there are also no alpha-males present to chase the young males away. They are often seen practicing the fighting skills they will need to learn in order to carve out their own territory and harem when they are older. The boardwalk area has a nice background for sunset shots, if you are fortunate enough to get a couple of males arguing in the foreground. And when you don’t have elephant seals in the foreground of your beach sunset shot, there are always shorebirds. Too bad there wasn’t an oak tree around, or I could have captured the majority of clichéd nature shots at one location…..
That’s it folks! I’m returning to the Bahamas for sharks and dolphins in May, and I promise to be more punctual about my next blog post from that trip! I was recently on the Golden Dawn, a live-aboard dive boat in Papua New Guinea. This was my fourth trip to PNG, and by far the least productive, photographically. We were plagued by bad weather, and the boat’s owner/captain had opted to go to a big diving trade show in the states (which he informed us about at the last minute), leaving his brother in charge. Suffice it to say his brother wasn’t all that well informed about the areas we were diving. It was particularly disappointing, given the remoteness of the location. Madang (where we got on the boat) is on the northeast coast of PNG, and Wewak (where we exited) is even further to the north. It took four days and four plane flights to get there, and three days and five plane flights to get back home. Disproportionate time/expense for the results. So it goes…..
We had a school of spinner dolphins (Stenella longirostris) riding our boat’s bow wake, on one of the few sunny days we encountered. This was early in the trip. Little did we know it would be our best photo opportunity. We saw a lot of turtles, most of which took off immediately because they were not used to seeing people. This hawksbill turtle Eretmochelys imbricata) was the exception–it hung around for quite a while, allowing several of us to photograph it. PNG is a haven for odd critters and macro photography, but we weren’t provided "critter spotters" from the boat’s crew on most of our dives. Even when someone did accompany us to point out stuff, our captain persisted in having all ten divers dumped on the same spot at the same time, so anything that was pointed out was soon surrounded by a cluster of fins and kicked-up sand. Since I’m a lousy critter finder, I found myself taking photos of anemonefish (here Amphiprion ocellaris) which are at least easy to spot–not exactly the kind of exotic subject matter one comes to PNG for. 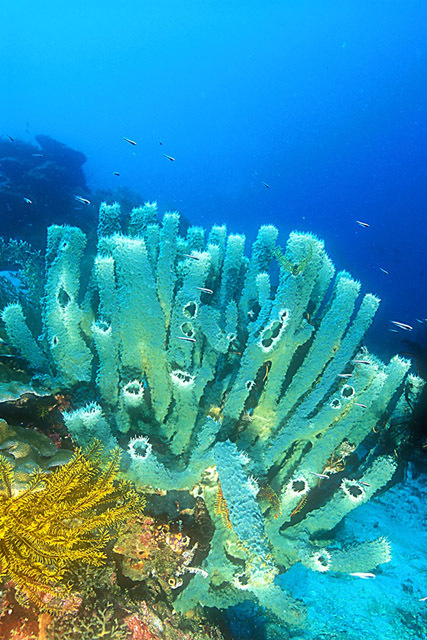 When we did have some decent ambient light, we saw a lot of nice sea fans. This shot was taken in the Hermit Islands. That’s Rich Lang in the background, who with his wife Judy was kind enough to put this trip together for us. 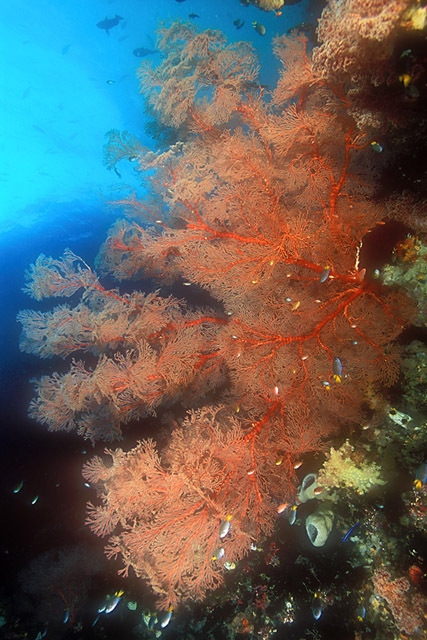 More sea fan stuff, this time in the Ninigo Island group. That’s a barracuda school in the background of the photo on the right. On the left is a group of blue trevally jacks (Carangoides ferdau) swimming by to check me out. On the right is a school of barracuda, either pickhandle (Sphyraena jello) or blackfin (Sphyraena genie). Both shots were also taken in the Ninigo Island group. Some of our best dives were made on the wreck of the India Maru, a Japanese cargo vessel sunk by allied aircraft during WWII. This was off the Kairiru Islands (near Wewak) towards the end of our trip. This is a longfin spadefish (Platax teira) being cleaned by wrasses. These two shots were also taken on the wreck of the India Maru. The slender fish is a trumpetfish (Aulostomus chinensis). The bow of this boat had eight (or more) lionfish (Pterois volitans) hanging out together, but I was only able to get a few of them in the same shot. Well that’s it folks! My friend Stuart Westmorland has gone to a lot of time and trouble to help me make my jpgs better, so I’d appreciate hearing whether or not you saw any noticeable differences in the quality of these images, vs. those in my earlier blog postings. I’m pleased to blog that I was awarded the Grand Prize in the 2005 photo contest put on annually by Popular Photography Magazine. The contest had ten categories on all subject matter, using any type of camera equipment. It received more than 10,000 entries from around the world. I was in the town of Gansbaai, South Africa in May 2003 to photograph great white sharks (Carcharodon carcharias). This is one of the most popular places in the world to photograph great white sharks. The shark photography is usually done on the surface from the boat, or underwater from inside a cage. A third method, which I was using, is via a pole cam. As you can see from the above photo, this involves putting the camera in a waterproof housing and attaching it with a bracket to a long pole, which is then lowered into the water and fired by means of a line attached to the trigger release on the housing. The pole cam enables you to get shark photos that are much closer than what you could normally get underwater from inside a cage. As you can see with the photos above (especially the one on the right) you wouldn’t want to be holding the camera housing with your hands when the shark is THIS close! We had just finished our shark photography for the day, so the crew threw overboard what was left of the bait we had been using to attract the sharks. I had pulled my pole cam out of the water to start disassembling it, when my friend & pro photographer Stuart Westmorland called my attention to the commotion on the water’s surface caused by kelp gulls (Larus dominicanus) who had arrived to feed on the discarded bait. I lowered the pole cam back to surface level and pulled the line, shooting at five frames per second to freeze the action. I had my wide angle zoom lens set to its widest setting, so the gulls were right next to the camera housing’s dome. I was pleased with several of the shots I got. Photo #004 above is the one that won the Grand Prize. I was also partial to #005 on the right, but did not enter it in the contest. For the techies out there: Nikon F100 camera in Sea & Sea housing with 9″ dome. Nikon 17-35 f2.8 zoom lens set at 17mm and f8 aperture. TTL exposure, shutter speed unrecorded. Natural light. Fuji Provia 100F slide film shot at ISO 200 and then pushed +1 stop in processing at a pro lab in San Francisco. Powered by WordPress Rendered in 20 queries and 0.472 seconds.